Cleveland, Ohio - 05-01-2010 - "Call us before you need us." That's sage advice in the world of heating, ventilating and air conditioning (HVAC) where preventive maintenance can help eliminate major repairs down the road. That is also the philosophy of Brennan & Associates Heating and Cooling, Inc., founded in Cleveland in 1977 as a one-stop shop for HVAC design, build and service. Properties has tapped the expertise of David Masciarelli, Brennan president and CEO, to explain how a proper HVAC preventive-maintenance program can benefit building owners and managers. can save money in the long run while keeping tenants happy." "Advantages of HVAC preventive maintenance include equipment and system reliability and longevity," Masciarelli says, "as well as healthy indoor-air quality. Given all the new rules and regulations pertaining to air quality, keeping HVAC systems clean is a must. Clean equipment and systems cut down on dust, mold and other unhealthy airborne particulates. And running clean equipment improves climate-control efficiency while reducing energy consumption and costs." Healthy air and reduced energy consumption, two major benefits of proper HVAC preventive maintenance, take on added importance in enclosed buildings - no operable windows - where indoor air quality relies completely on HVAC systems. Such systems can operate 24/7 and can eat up energy - and the pocketbook - as energy costs continue to escalate. So what is involved in proper preventive maintenance? It requires a set schedule of checking and changing belts as well as checking and replacing filters. Also important: lubrication of motors and dampers. Preventive maintenance will also include inspection of heat exchangers. "Heat-exchanger inspection is critical," says Masciarelli. "Cracks in heat exchangers can release carbon monoxide into the airstream." Beyond that, a thorough maintenance checkup will include proper calibration of controls, checking all operating safeties, cleaning of burners and airconditioning coils, and measurement of air temperatures and system pressures to ensure proper heating and cooling. Performed on a regular schedule, preventive maintenance will keep small problems such as dirty filters or worn belts from becoming major headaches for property owners and tenants. Masciarelli recalls one customer that decided against preventive maintenance and then ended up calling back for emergency service when the HVAC equipment broke down - in the middle of winter of course. "The filters were very dirty and a belt broke, which caused larger problems," Masciarelli recalls. "As repairs were made, the customer told me that, experiencing a major HVAC breakdown, he could no longer afford not to have a preventive-maintenance contract." Of course, preventive maintenance should be performed by experienced, qualified specialists. A qualified service technician should be familiar with systems and equipment from various manufacturers to ensure proper preventive maintenance and rapid repair. With more than 30 years in the business and 30 experienced employees, Brennan & Associates has developed what Masciarelli believes is a comprehensive preventive-maintenance program for clients. That begins with entry of a client's HVAC equipment list into a database, including all maintenance information from the equipment manufacturer. Trained service technicians then perform a complete preventive-maintenance inspection via a checklist created specifically for a client's system and equipment. Over time, the database builds to include all maintenance performed along with dates, parts replaced, etc. That enables efficient service and quick diagnostic capability should an emergency repair be necessary. "Call us before you need us." This smart preventive-maintenance advice can ensure building owners and managers high levels of heating and cooling system performance along with high reliability and efficiency. And it will help them save money over the long run while keeping tenants and employees comfortable. 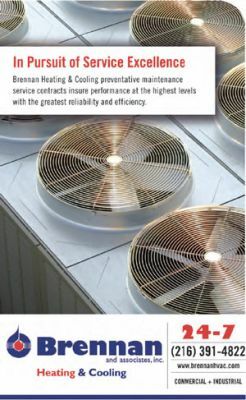 For more information, visit Brennan Heating & Cooling online at www.brennanhvac.com. Copyright © 2019 Brennan Heating & Cooling, Inc.